A wise man once said that the best time to leave a party is while everyone is still having fun. The same can be said for race car drivers in deciding when to end their driving careers. 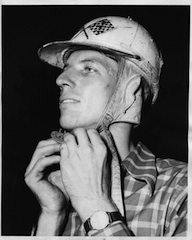 Many a race car driver hangs on to the steering wheel long after they’ve passed their driving prime, but NASCAR Hall of Famer Glen Wood ran his final race as a driver when he was still among the sport’s best. 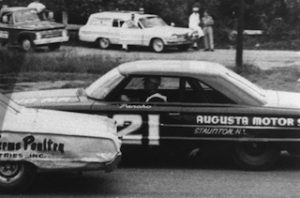 Wood’s last run came at one of his home tracks, Starkey Speedway near Roanoke, Va., on Aug. 23, 1964 in a race for the series now known as Sprint Cup. “Ironically that was the only race that I helped promote,” he said. Panch had been driving the No. 21 Ford on the bigger tracks, while Wood drove on most of the shorter ovals. And since his was the bigger name around Starkey, Wood would do the driving. “It was thought at the time that since I had won seven in a row there with my Modified we’d have a better crowd if I drove it,” Wood said. He qualified on the pole for the 50-mile run on the quarter-mile paved track. He and Junior Johnson won their respective 25-lap heat races, but the wins came at considerable expense to their softer left-side tires. Since Johnson had been the one who helped Wood get the softer left-side tires, Wood agreed to let Johnson have his best left-side tire and he’d run hard tires on the left side of the No. 21. “If I had known that that was the last race I’d ever run, he’d have had to put on some hard tires like I did,” Wood said. “He might have still outrun me that way, but I thought he’d blow the tire out. Ned Jarrett caught Wood too, and he let him pass as well. “After I let Junior go, I wasn’t too concerned about where I finished,” Wood said. Even with the win out of his grasp, Wood had to draw the line somewhere. “About five laps to go, I felt somebody tap me in the rear end,” he said. It was David Pearson in Cotton Owens’ No. 6 Dodge. Johnson won over Jarrett, Wood and Pearson, but top four in that race turned out to have a lot more in common than good finishes at Starkey Speedway. All have since been become members of one of the first three classes of the NASCAR Hall of Fame. The 15th-place finisher at Starkey made it too, in the first round. His name – Richard Petty. Five future Hall of Famers in a race is a statistic any promoter could be proud of. A one-hour biography reflecting on Glen Wood’s career will be featured on SPEED TV tonight, January 13, 2012, at 8 p.m. est.